Religion in Sweden is diversified. Christianity was the religion of virtually all of the Swedish population from the 12th to the early 20th century, but it has rapidly declined throughout the late 20th and early 21st century. In 2015, legally registered Christians comprised 69.9% of the total population. The Lutheran Church of Sweden — which was the state religion until 2000 — has a registered membership of 6.0 million Swedish citizens as of 2017, equal to 59.3% of the total population. One reason for the high membership might be the fact that until 1996 all newborns with at least one parent being a member of the Church of Sweden were also registered as members of the church. Yet the membership is declining rapidly, about 1% each year, for the most recent years even 2%, falling from 95% in 1970 and 85% in 2000. Prior to their Christianisation that became complete around the 12th century, the Swedes practised forms of Norse religion. At first they became part of the Catholic Church; then, from the 1530s, Sweden switched to Lutheranism as part of the Protestant Reformation which converted most of Germanic Europe; the Church of Sweden was formed and remained the official religion of the Christian state until the turn of the 21st century. The 21st century brought with itself a rapid decline of Christianity overall, the disestablishment of the Church of Sweden, and the modest growth of other religions, often brought by waves of immigration from outside the country. These last include Islam, Catholic Christianity, Orthodox Christianity, Buddhism, Hinduism and other Eastern religions. Before the 11th century, Swedes practised Norse religion, worshipping a variety of Germanic deities. An important religious centre was the Temple at Uppsala. The shape and location of this temple is sparsely documented, but it is referenced in the Norse sagas and Saxo Grammaticus' Gesta Danorum, and is also described by Adam of Bremen. It was probably destroyed by King Ingold I in 1087 during the last known battle between the pagans and the Christians. While Norse religion was officially abandoned with the Christianization of Scandinavia, belief in many spirits of Norse mythology such as tomtar, trolls, elves and dwarves lived on for a long time in Scandinavian folklore. The historical Vadstena Abbey of the Catholic order of the Bridgettines, founded by Bridget of Sweden. The oldest evidence of Christian burial sites in Sweden are dated to the 6th century, but they are very few in number. The earliest documented campaign to Christianise the Swedes was made by the monk Ansgar (801–865). Making his first visit to Birka in 828–829, he was granted permission to build a church. In 831, he returned home and became Archbishop of Hamburg-Bremen, with responsibility for Christianity in the north. Around 850, he came back to Birka, where the original congregation had been shattered. Ansgar tried to reestablish it, but it only lasted a few years. Christianity first gained a hold in Västergötland, probably due to mercantile ties to the Christian Anglo-Saxon kingdoms in England. Remnants of a 9th-century church building has recently been excavated in Varnhem. The diocese of Skara, which is the oldest diocese in Sweden, emerged under the Archdiocese of Hamburg-Bremen, in the late 10th century. According to Adam of Bremen, the Christian king Olof Skötkonung, who ruled from c. 995 to c. 1022 was forced to limit Christian activities to the western province. When King Stenkil ascended to the throne in 1060 Christianity was firmly established throughout most of Sweden, although the people of Uppland, and probably Sodermanland, resisted the new religion. The last king adhering to the old religion was Blot-Sweyn, who reigned 1084–1087. A handful of local saints (canonized on diocesan level before the centralized process became normative in 1170–1200), folk saints and clerics were allegedly martyred as late as the 1120s, most of them in Sodermanland and Uppland. Under the reign of Eric the Saint (1150–1160) Christianity became an ideological factor of the state, and the First Swedish Crusade took place; it was a military expedition aimed at converting the Finns to Christianity and conquering Finland as Swedish territory. (However, no archeological data or written sources seem to support the legend. The diocese and bishop of Finland are not listed among their Swedish counterparts before the 1250s). A national church of Sweden was not organized until 1164, when the first archbishop of Uppsala received his pallium from the archbishop of Lund. Pre-Reformation Swedish Catholic religious leaders — including Bridget of Sweden, founder of the continuously functioning Catholic Vadstena Abbey — continue to be held in high regard by the population as a whole. Her nunnery at Vadstena is one of Sweden's pre-eminent tourist attractions. Ruins of Alvastra Monastery in Ödeshög. Various ruined medieval Catholic monasteries such as this one stand as testimonies of the appropriation of Catholic properties by the Swedish state during the Protestant Reformation. Shortly after Gustav Vasa was elected king in 1523, he asked the Pope to confirm Johannes Magnus as Archbishop of Sweden, replacing Gustav Trolle, who had supported the Danish king Christian II and was convicted for treason. When the Pope refused, Gustav Vasa — he himself a proponent of a "Renaissance Biblical Humanism" — started to promote the Swedish Lutheran reformers Olaus, Laurentius Petri, and Laurentius Andreae. Gustav Trolle was eventually forced into exile, and soon all ecclesiastical property was transferred to the Crown. In 1531, Laurentius Petri was appointed by the Crown to become the first Lutheran primate of Sweden, and was ordained by five Catholic bishops without papal assent. The ties with Rome were irreversibly cut in 1536, when Canon Law was abolished. Originally, no changes were made to official church doctrine, and the episcopal organization was retained. Gradually, in spite of popular protests against the introduction of "Luthery", teachings were aligned with continental Lutheranism. Calvinism was, otherwise, refuted as heresy at the synod of Stockholm in 1565. In order to appease the Holy See, king John III of Sweden, one of Gustav Vasa's sons, took measures to bring the Church of Sweden to a theological position influenced by George Cassander, but, in the heat of controversy, such a compromise position did not achieve its intent of reunion. However, after his death, his brother, Duke Charles, summoned the Uppsala Synod in 1593, which declared the Holy Scriptures the sole guideline for faith, with four documents accepted as faithful and authoritative explanations of it: the Apostles' Creed, the Nicene Creed, the Athanasian Creed, and the unaltered Augsburg Confession of 1530. The Uppsala Synod also reinstated The Swedish Church Ordinance of 1572, which remained in use until 1686. The move put Charles at odds with the heir to the throne, his nephew Sigismund, who was raised in the Catholic faith. Although Sigismund promised to uphold Lutheranism, Duke Charles's aspirations to power led to the War against Sigismund, a power struggle that was effectively decided at the Battle of Stångebro in 1598, in favour of Charles and Protestantism. During the era following the Protestant Reformation, usually known as the period of Lutheran Orthodoxy, small groups of non-Lutherans, especially Calvinist Dutchmen, the Moravian Church and Walloon immigrants from the Southern Netherlands, played a significant role in trade and industry, and were quietly tolerated as long as they kept a low profile. The Sami, who originally had their own shamanistic religion, were converted to Lutheranism by Swedish missionaries in the 17th and 18th centuries. Citizens of foreign nations, mainly Russians, were granted freedom to practice Eastern Orthodox Christianity since the Treaty of Stolbovo in 1617. Anglican and Calvinist foreigners were granted freedom to practice their religions in Stockholm (1741) and Gothenburg (1747). Similar liberties were granted Catholics in 1781, and an apostolic vicar was sent to Sweden in 1783. In order to curb Pietism several royal decrees and parliament acts were issued in the 18th century; they forbade Swedish citizens to practice any religion besides mandatory Lutheran Sunday mass and daily family devotions. Without the presence of a Lutheran clergyman public religious gatherings were forbidden. It remained illegal until 1860 for Lutheran Swedes to convert to another confession or religion. In 1860 it became legal to leave the Church of Sweden for the purpose of becoming a member of another officially recognised religious denomination. From 1951, it became legal to leave the church, without providing any reason. From 1951 to 1977 all religious institutions could only be established with the permission of the Crown. A temple of Chinese Buddhism in Rosersberg, Stockholm. Church of Scientology in Malmö. The constitution of Sweden provides for freedom of religion, and the government generally respects this right in practice. The government at all levels seeks to protect this right in full and does not tolerate its abuse, either by governmental or private actors. The rights and freedoms enumerated in the constitution include the rights to practice one's religion and protection of religious freedom. The laws concerning religious freedoms are generally observed and enforced at all government levels and by the courts in a non-discriminatory fashion. Legal protections cover discrimination or persecution by private actors. In the early 2000s about 85% of Swedes still belonged to the Church of Sweden. By the end of 2017, this figure had fallen to 59.3%. The percentage of Swedes belonging to the Church of Sweden is decreasing yearly by more than one percent. In the year 2016, according to an online survey held among about 500 working-age, internet connected people in Sweden, only 24% of the participants claim to believe in Protestantism. 45% of the participants claim not to have any religious or spiritual belief, of whom 33% are atheists and 13% are agnostics. 13% say that they hold spiritual beliefs but they are not religious. Immigration and conversion has brought into Sweden a variety of religions from the East, including Islam (3%) and Buddhism (1%), but also new populations of Catholics (4%), and Orthodox Christianity (3%). Eight recognized religious denominations, in addition to the Church of Sweden, raise revenues through member-contributions made through the national tax system. All recognized denominations are entitled to direct government financial support, contributions made through the national tax system, or a mix of both. Certain Christian holidays are national holidays. School students from minority religious backgrounds are entitled to take relevant religious holidays. No recognition or registration is required to carry out religious activity. Religious groups that want to receive government aid may apply for it. Education about all major world religions is compulsory in public schools. Parents may send their children to religious charter schools, all of which receive school vouchers, provided they adhere to government guidelines on core academic curriculum. The Office of the Ombudsman against Ethnic Discrimination investigates claims of discrimination "due to race, skin color, national or ethnic origin, or religion". Discrimination on religious grounds is illegal, including discrimination in the work place and in the provision of public and private services. In 2016 the International Social Survey Programme found that 70.2% of the Swedish population declared to belong to a Christian denomination, with the Church of Sweden being the largest Church accounting for the 65.8% of the respondents; the Free Church was the second-largest Church accounting for the 2.8%, the Roman Catholics were the 0.7% and the Eastern Orthodox were the 0.5%; members of other Christian denominations comprised the 0.4% of the total population. A further 28.5% declared to have no religion, 1.1% to be Muslim and 0.3% declared to belong to other religions. 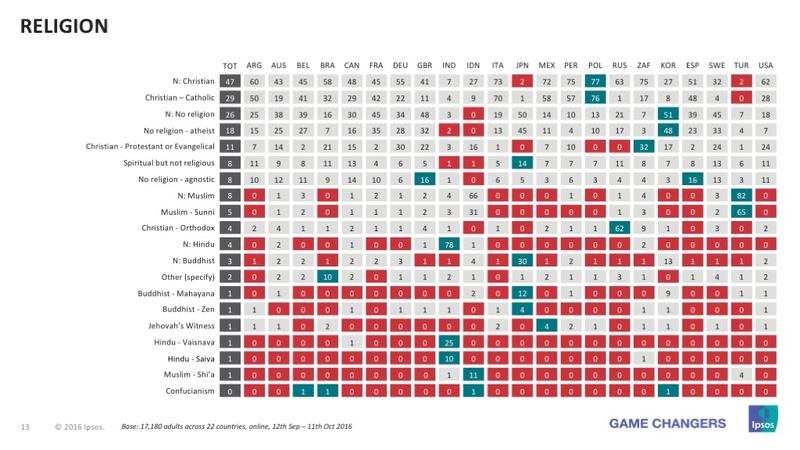 In 2015 the Eurobarometer found that Christianity was the religion for 47.6% of the respondents, with Protestantism being the main denomination with 36.5%, followed by other Christians with 8.6%, Catholics with 1.6% and Eastern Orthodox with 0.8%. 31.0% of the sample declared to be Agnostic and 19.0% declared to be atheist. The Bahá'ís claim about 1,000 Bahá'ís and 25 local assemblies in Sweden from Umeå in the north to Malmö in the south. In November 2009 the Swedish paper Västerbottens-Kuriren reported that 25 local non-profit Bahá'í organization had changed their organizational form to religious communions. The central Bahá'í secretariat in Stockholm stated at the time that the Baha'i Faith in Sweden had 1003 members. The Association of Religion Data Archives (relying on World Christian Encyclopedia) estimated some 6,200 Bahá'ís in 2005. In 2014, there were 4,812 formal affiliated Buddhists in Sweden, comprising 0.05% of the total population. A 2016 survey by Ipsos based on 500 working-age, internet connected Swedes, found that 1% of the respondents declared to be Buddhists. Side view of Uppsala Cathedral, the headquarters of the Church of Sweden. Catholic Church of Christ the King in Göteborg. A Jehovah's kingdom hall in Kristinehamn. In 2015 there were 6,886,501 formal affiliated Christians in Sweden, comprising 69.9% of the total population. Survey results are various, for example, according to a 2016 Ipsos survey, only 32% of the approximately 500 working-age, internet connected participants claimed to belong to Christianity, and among them 24% belong to Protestantism, 4% to Catholicism, 3% to Orthodox Christianity and 1% to the Jehovah's Witnesses. Another survey by the Pew Research Center found in Spring 2016 that 66.7% out of a sample of 1,000 Swedes claimed to be Christians. As of 2015, 6,601,113 people, or 67% of the total population, were registered members of the various Protestant denominations in Sweden. About 4 out of 10 (42.4%) children are christened in the Church of Sweden. About 1 out of 3 (31.6%) weddings take place in church. About 3 out of 4 (72.9%) Swedes have Christian burials. It is an Evangelical Lutheran community of faith manifested in parishes and dioceses. The church also has a national organisation. It is an open national church which, working with a democratic organisation and through the ministry of the church, covers the whole nation. The primate of the Church of Sweden is the Archbishop of Uppsala. The 19th century saw the arrival of various evangelical free churches, and, towards the end of the century secularism, leading many to distance themselves from church rituals. Leaving the Church of Sweden became legal with the so-called Dissenter Law of 1860, but only under the provision of entering another denomination. The right to stand outside any religious denomination was established in the law on freedom of religion in 1951. Today, the Swedish Free Church Council (Swedish: Sveriges Frikyrkosamråd) organizes free churches in Sweden, belonging to various Protestant denominations: Calvinist, Pentecostal, and others. In total the member churches have around 250,000 members. Baptists, Methodists and the Mission Covenant Church of Sweden merged in 2011 into a new denomination: the Uniting Church in Sweden. It is the largest member church in the Swedish Free Church Council, with approximately 65,000 members. One of the Baptist denominations, the Evangelical Free Church in Sweden, has remained an independent denomination outside this merger. Most Catholics in Sweden are of Slavic (especially Poles and Croats), South American or Middle Eastern (especially Assyrian) origin. As of 2015, legally registered Catholics in Sweden were 113,053, comprising 1.2% of the total population. According to Ipsos, in 2016 Catholic Church in Sweden account for 4% of the working-age, internet connected population, while the Pew Research Center found a percentage of 1.2% in April 2016. According to the 2015 Yearbook of Jehovah's Witnesses, there are 22,730 active members in Sweden, and 36,270 people attended their annual memorial of Christ's death. This number includes active members and guests. As of 2016, 1% of the working-age, internet connected population of Sweden declared to be Jehovah's Witnesses. Multiple Orthodox jurisdictions exist in Sweden, including but not limited to the Greek and Serbian Orthodox Churches. There is also a substantial presence of Coptic and Ethiopian Christians. The Serbian Orthodox Church has several parishes in Sweden, under jurisdiction of Serbian Orthodox Eparchy of Britain and Scandinavia. The Church of the Goths has a presence in Gotland. As of 2015, legally registered Eastern Orthodox Christians were 140,275 and they were the second-largest Christian sect in Sweden, comprising the 1.4% of the total population. A 2016 survey found that 3% of the working-age, internet connected population of Sweden declared to be Orthodox Christians. 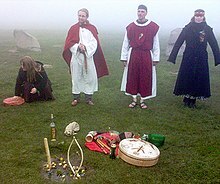 Members of Forn Sed Sweden holding a sacrifice. Germanic Heathenry, the contemporary continuation of ancient Germanic religion, is represented by various organizations, including the Nordic Society of the Ese (Nordiska Asa-samfundet), the Swedish Forn Sed Assembly (Samfundet Forn Sed Sverige) and the Community for Nordic Faith (Samfälligheten för Nordisk Sed). The Nordic Society of the Ese, despite being the most recently founded amongst the three (it was founded in 2013), has quickly grown to become the largest Heathen organization in Sweden. Korsnäs gård, main building 2014. IRF 2005 reports that there are between 7,000 and 10,000 Hindus. Of the 10,000 Hindus, 2,000 are of Tamil Origin  and 1,500 are of Bengali Origin. Islam entered Sweden primarily through immigration from countries with large Muslim populations (such as Bosnia and Herzegovina, Turkey, Iraq, Morocco, Iran, and Somalia ) in the late 20th century. The Baltic Tatars were the first Muslim group in modern Sweden. In 2009 it was estimated that there were 450,000 to 500,000 Muslims in Sweden, around 5% of the total population, while there were only 139,759 formally affiliated Muslims in 2015. As of 2016, 3% of the working-age, internet connected population of Sweden claimed to be believers in Islam. The Official Council of Swedish Jewish Communities estimates about 20,000 ethnic Jews in Sweden by halakhic criteria. Of them, about 8,302 were members of a Jewish religious congregation in 2015. Stockholm has the largest community and boasts a primary school, a kindergarten, a library, a bi-monthly publication (Judisk Krönika) and a weekly Jewish radio program. Other cities like Malmö, Gothenburg, Borås, Helsingborg, Lund, and Uppsala have Jewish communities as well. 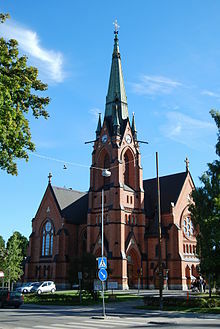 Synagogues can be found in Stockholm (which has two Orthodox and one Conservative synagogue), Göteborg (one Orthodox and one Conservative synagogue), Malmö (one Orthodox synagogue), and in Norrköping (although the Norrköping community is too small to perform regular services). ^ a b c d e f g h "Statistik 2015 - Myndigheten för stöd till trossamfund". www.sst.a.se (in Swedish). 2015. Archived from the original on February 2017. Retrieved 9 October 2017. ^ a b c d e f g h i "Svenska kyrkan i siffror". Church of Sweden (Svenska kyrkan). ^ Wendy Sloane (1995-10-04). "Sweden Snaps Strong Ties Between Church and State". The Christian Science Monitor. Retrieved 2016-03-07. ^ N.F. Lutheran Cyclopedia, article, "Upsala, Diet of", New York: Schrivner, 1899. p. 528–29. ^ a b c d e "International Religious Freedom Report 2006 - Sweden". U.S. Department of State - Bureau of Democracy, Human Rights, and Labor. October 26, 2009. Retrieved 2010-07-19. ^ "Spring 2017 Survey Data | Pew Research Center". Pew Research Center's Global Attitudes Project. Retrieved 2018-10-23. ^ "Country specific religious affiliation or denomination: Sweden - weighted". International Social Survey Programme: Role of Government V - ISSP 2016. 2016 – via GESIS. ^ a b "Sweden: How Many Jehovah's Witnesses Are There?". JW.ORG. Retrieved 2017-10-07. ^ "LDS Statistics and Church Facts | Total Church Membership". www.mormonnewsroom.org. Retrieved 2017-10-09. ^ "English Summary". National Spiritual Assembly of the Bahá'ís of Sweden. Archived from the original on 2009-09-09. Retrieved 2009-07-04. . The Bahá'ís only count adults 21 years or older, who have declared their faith in Bahá'u'lláh by signing a testimonial. If the Baha'i believers, like the Muslims, should count all children is the number of Bahá'ís in Sweden over 3000. ^ "Forening blir forsamling" in Västerbottens-Kuriren 30 November 2009. Umeå: Article by Anders Wynne. ^ "Most Baha'i Nations (2005)". QuickLists > Compare Nations > Religions >. The Association of Religion Data Archives. 2005. Retrieved 2009-07-04. ^ a b c "Spring 2016 Survey Data | Pew Research Center". www.pewglobal.org. Retrieved 2017-10-09. ^ "Discrimination in the EU in 2012 – Special Eurobarometer 393 (The question asked was "Do you consider yourself to be...?")" (PDF). European Commission. Retrieved 2 February 2016. ^ a b c "Döpta, konfirmerade, vigda och begravda enligt Svenska kyrkans ordning år 1970-2017". Church of Sweden (Svenska kyrkan). ^ 2012 Yearbook of Jehovah's Witnesses. JW.org. Retrieved January 9, 2014. ^ Jacob Zetterman. "Asatron frodas i en nationalistisk miljö". Dagen, 18 November 2016. ^ International Religious Freedom Report 2009 : Sweden, U.S. Department Of State. ^ "Antal judar". Judiska Centralrådet (in Swedish). This page was last edited on 26 March 2019, at 22:14 (UTC).